From Christmas cards, that is!!!! I have been making lots of Christmassy things for ages and I am slightly over it!! I have a dear friend having a birthday this week, so I wanted to make a special card for her. I have to say I really enjoyed making something else!! 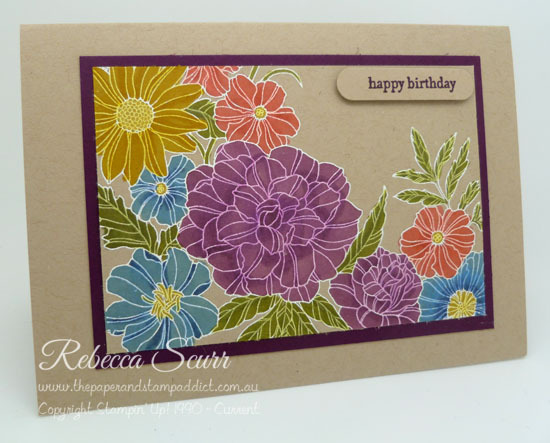 I wanted to use the Corner Garden stamp set and my blendabilities. Honestly, it’s been ages since I used them!! So a quick search on Pinterest found this lovely card by It’s a Stamp Thing. I love the way she uses only a portion of the stamp. As my friend loves anything purple, I had to use Blackberry Bliss. This is such a gorgeous deep purple. The photos definitely don’t do it justice. I embossed the crumb cake cardstock with white embossing powder. This looked lovely all on it’s own. I will have to try it with coloured cardstock as well. I then coloured it with Old Olive for the leaves, and then Calypso Coral, Daffodil Delight, Rich Razzleberry and Night of Navy. Stamps: Corner Garden, Teeny Tiny Sentiments. Accessories: White Embossing Powder, Old Olive Blendabilities, Calypso Coral Blendabilities, Daffodil Delight Blendabilities, Rich Razzleberry Blendabilities and Night of Navy Blendabilities, Word Window punch.